Dennis L. Grebe - Burns Anderson Jury & Brenner, L.L.P. Dennis is a native Texan born and raised in Bay City, Texas. He attended Trinity University in San Antonio for his undergraduate degree. Following graduation from Trinity, Dennis spent time traveling and working at various farms throughout New Zealand, but before too long he was back in Texas attending the University of Texas School of Law for his law degree. During law school, Dennis clerked at BAJB gaining valuable exposure and experience to aid in his practice today. Dennis’ practice primarily involves representing workers’ compensation carriers at the administrative level. However, he has experience in insurance and construction litigation through all phases of the litigation process. Dennis has represented his clients’ interests during hearings, depositions, and other pre-trial matters. 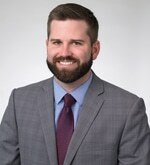 Dennis is a member of the Austin Bar Association and Austin Young Lawyers Association. When not practicing law, he enjoys spending time with his beautiful wife Sara and their lab, Dude.